Spot the difference in every side-by-side scene as you explore the park with a whole host of cute characters. From the dog park, to the lake, and the flower garden, there's plenty waiting to be found. What looks different? Lift the flaps to see if you got it right! Accompanied by a sweet rhyming text, stylish illustrations are printed on sturdy card for little fingers. This new novelty series teaches recognition and visual acuity skills, featuring: patterns, colours, shapes, missing items, animals, food and items of clothing. 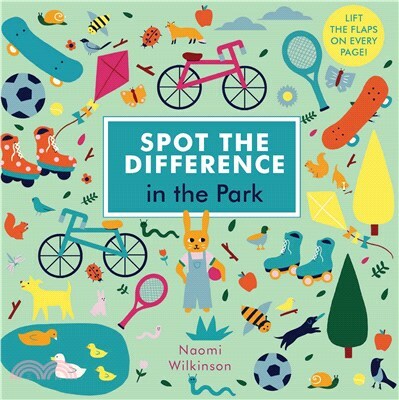 Naomi Wilkinson grew up in a small victorian seaside town and now lives in Bristol with her partner, daughter and dog. She spends hours obsessing over colour combinations and creating her illustrations, which are inspired by vintage children's books, lovely packaging and folk art.